Brickwork restoration is an important part of all London properties. Eventually you might like to have your brick looking like new again. That beautiful yellow from the Victorian era. There might be more structural issues at hand such as loose bricks and cracked wall. It’s possible that your pointing has come away leaving the wall not only structurally compromised, but water penetrating the face brick is causing damp issues. Our partner Brick Work Restoration services take care of the whole process for you from start to finish with our expert guidance. We will ensure correct methods and strict procedure are applied. We can remove pebble dash and specialise in tuck pointing. Our team is highly skilled and qualified for all aspects of brick work restoration. Cleaning face brick can have an instant impact on the quality of your build. I highly recommend taking a look at this image which shows the difference in aesthetics on a building that has been neglected. Whilst this example highlights just how important cleaning can be to the overall value of your property. The difference in saleability after we have cleaned and sealed your brickwork is considerable and first impressions are the most important in any high value sale. You would not sell a property easily with the staining shown above, it is just a sign of neglect. Brickwork restoration can also provide structural help. Theres the possibility that your lintel has shifted above a window or door. We can remove the offending bricks. and then rebuild and construct as required. A falling arch above a sash window can be extremely dangerous and must be given serious attention. 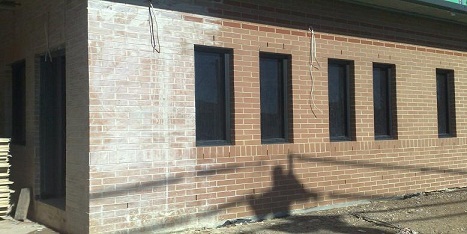 Brick will normally be cleaned using acid or sand blasting. We prefer acid because sandblasting can cause damage to your brick. Acid is not perfect but once sealed it’s highly unlikely that your brick will have any long term issues. Because bricks are porous it is important that a quality sealer is used. Without a quality sealer you’ll find an issue with water ingress. This can be catastrophic causing internal damp and damage to plaster and decoration. Using the correct techniques and materials can eliminate all of these pitfalls. We’ve dozens of satisfied customers and invite you to partner with us in achieving high quality property investment and development. Our brick work restoration carries varying length guarantees based on the work carried out, however brickwork cleaning for example is guaranteed until it becomes dirty again! This can take as many as 15 years to fade in colour considerably based on the quality of work we do.